Pricecrawler, pricerobot, prisrobot, pricegrabber - you name it! 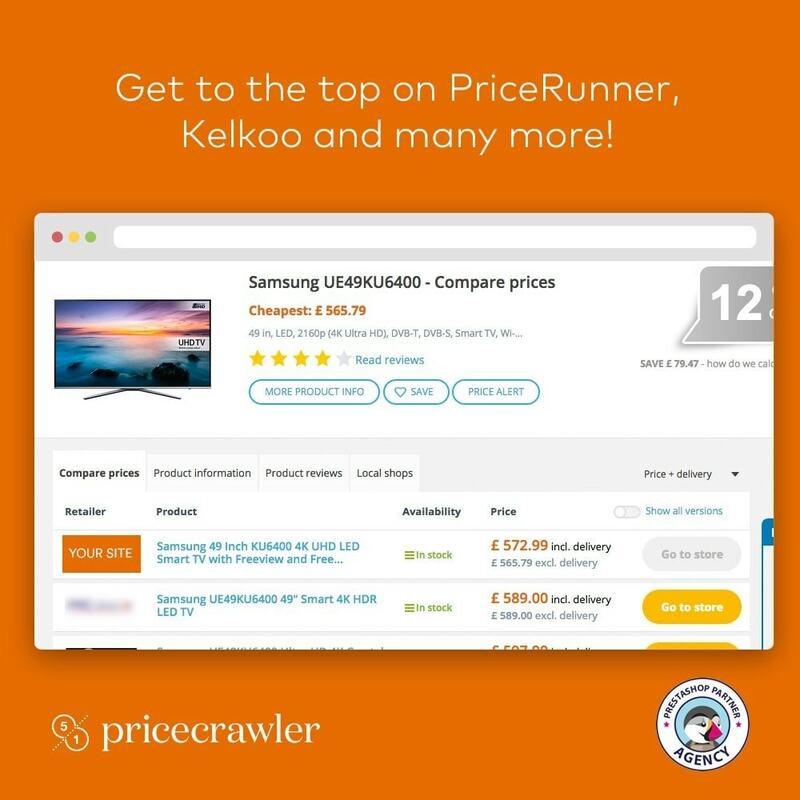 With this module you will be able to grab/crawl/adjust prices on PriceRunner. This module allows you to choose which product you want to set in crawling mode. 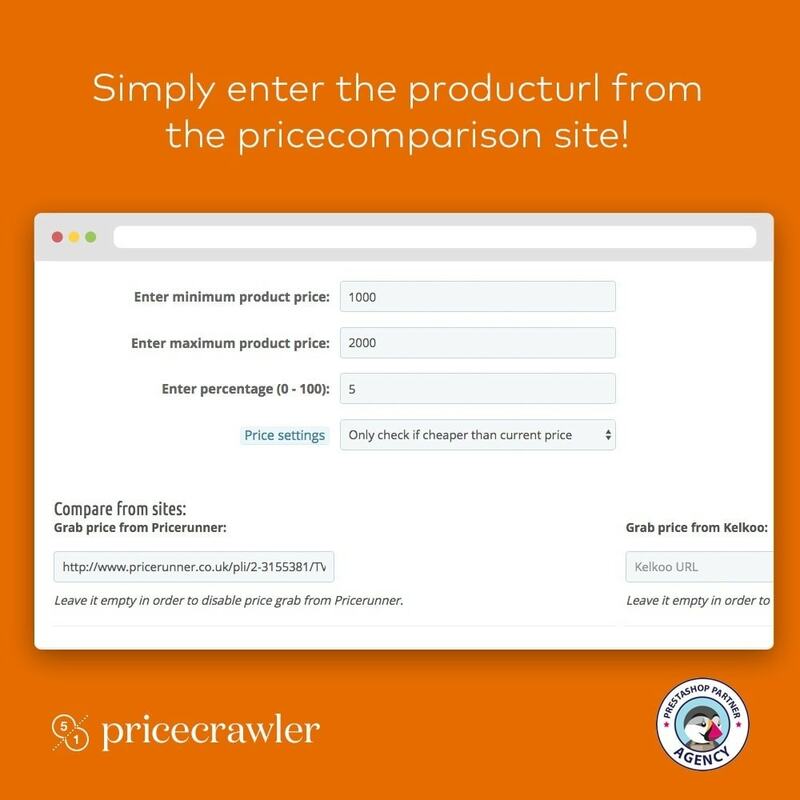 Simply find the same product you sell on the specific pricecomparison site, copy the url, paste it in the module configuration and start crawling! You dont nessecerarly have to be on Pricerunner, you can still promote yourself as the cheapest on these sites! However, if your shop is on the pricecomparison site, you will now be the first and the cheapest! If you have priceguarantee on your shop, this will benefit 100% since it will be hard for the customer to find the product cheaper anywhere! This module is not like other crawling scripts. This module strain or load the sites that it is crawling prices from. The module simply takes the html sourcecode from the url you have set and will then sort the prices that it takes out from the sourcecode. If you have any questions, please do not hesitate to contact our support team. Support can be provided in English or Danish. This module currently does not work with multishop. Give your customers the cheapest price of your product. Increase your sales with Pricecrawler. Today, PriceRunner, and other pricecomparison sites have become inevitable for customers. Whenever a customer wants to buy a product, more often they will check pricecomparison sites, especially on brand products. 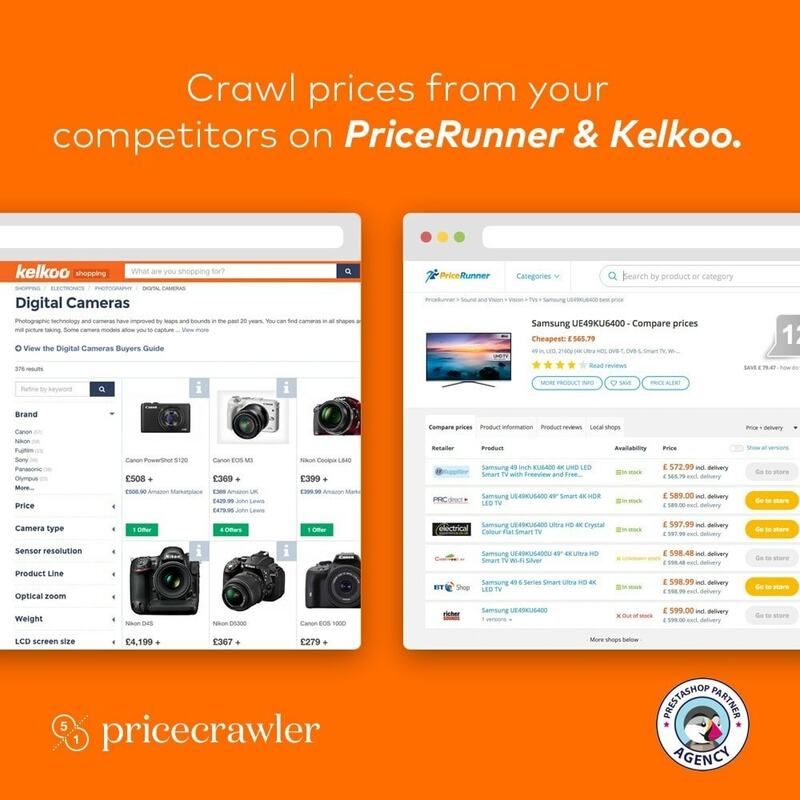 Increase your sales with Pricecrawler - start pricematching today! 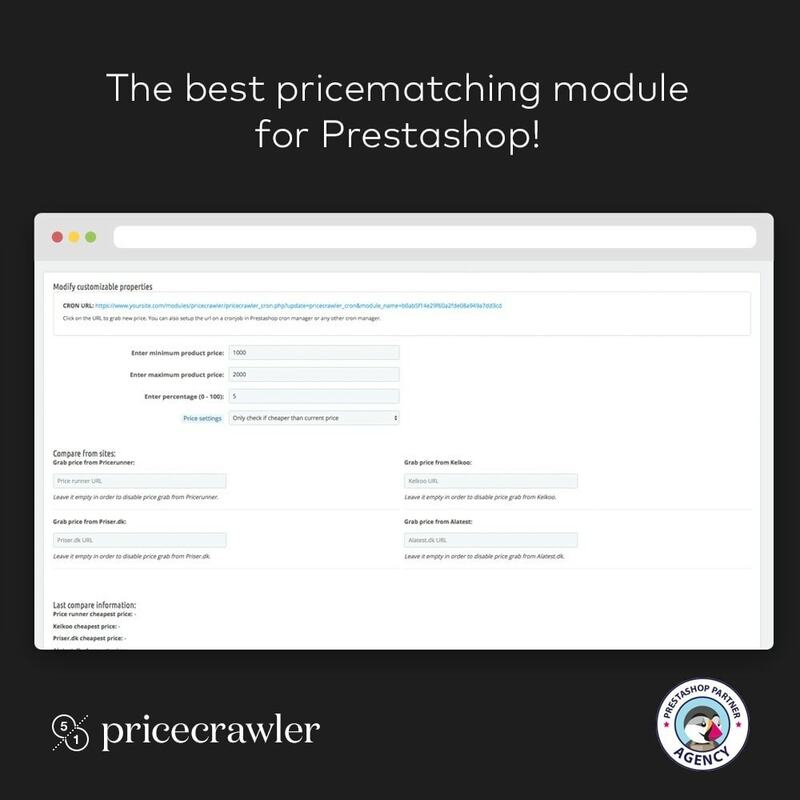 The best way to use this module is if you already have your products on the pricecomparison sites. However, if you dont have your site on ex. Pricerunner, you will still be able to promote the product as the cheapest! NOTICE! Overcrawling too much from Pricerunner can lead to IP ban of your website to crawl on Pricerunner anymore. After that, you will have to open a monthly crawling contract with Pricerunner in order to continue crawling. Therefore, do not overload Pricerunner servers with too many requests, otherwise you will pay a monthly fee to Pricerunner to continue the crawling. Contact Pricerunner if you are in doubt. Should Pricerunner ever change their crawling policy, under no circumstances can we guarantee the module will continue to work. Refunds for these issues are not issued, as long as the module still works while your url is not IP banned.